Corgi is probably the best-known die-cast company in the world. Renowned for its attention to detail and accuracy, Corgi are amongst the most sought-after die-cast collectibles and toys. For over 50 years Corgi has produced models of many types of cars, planes, trucks and buses, with a diverse range covering everything from Batman and Noddy to classic Limited Edition WWII Lancasters and Spitfires. Many of the popular ranges include favourite TV and Film characters from James Bond to Red Dwarf, with a growing selection of toys including a recent new BBC hit, Little Red Tractor. Corgi products appeal to everyone from young children to those with an eye for detail and authenticity. Quality is, of course, guaranteed. Corgi’s famous model vehicles captured the imagination of millions of baby-boomers and, what were once simply "toys for boys", are now highly sought-after in the expanding collectibles market. Some models, in mint condition and complete with box, which originally sold for just a few shillings are now fetching hundreds of pounds. Today, the majority of Corgi cars, trucks and buses are produced as once-only Limited Editions and are often sold out within weeks of release. In 50 year’s, Corgi has produced models of virtually every type of car, bus and truck you can imagine. Some of Corgi’s most sought-after model cars include the 1965 Monte Carlo Rally Mini Cooper S (£300 to £400), 1966 The Man from U.N.C.L.E’s ’Thrushbuster’ Oldsmobile (£250-£300), 1959-61 Ford Thunderbird Hardtop, pale green body (£175-£200). And, if you have the right Noddy’s car, produced in 1969, lurking in the attic, today it could be worth over £700! 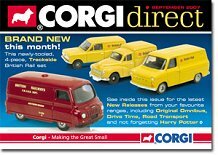 While you may not immediately think of Corgi as a mail-order company, Corgi does indeed have an excellent printed catalogue available, Corgi Direct, which you may request from the Corgi website, with all the very latest releases, special offers and best sellers. Corgi Classics is operated independently. See other independently operated catalogues, or catalogues from other UK mail-order companies. You may find similar UK catalogues to Corgi Classics, or similar products, within the catalogue categories defined for Corgi Classics. Corgi may easily be contacted if you need to, by any of the usual methods, including e-mail, telephone and by regular post. Corgi does not offer credit facilities to retail customers, and all purchases from the website must be paid for when you order them, by credit card or debit card.